M&M Pony Express LLC is brought to you by the owners of Inflatable Party Magic LLC. We provide children's pony rides for birthday parties, daycares, churches, schools, and special events. All of our ponies are gentle and have been exposed to children and adults in many different settings and elements. They all love children and attention. We provide a safe fenced environment and helmets for all the children to wear to ensure safety at all times. It is best to call us to book pony rides especially if you are wanting to book pony rides and other attractions. 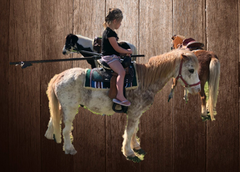 Pony rides are priced by the hour and other attractions and rental equipment is priced by the day. If booking multiple items, we will help you with the bookings for the ponies so you are only priced for the time you need them since you do pay hourly for ponies. It is possible to have ponies for only 2 hours from M&M Pony Express and still rent an inflatable for all day with Inflatable Party Magic LLC. Inflatable Party Magic LLC will deliver inflatables and any other rental items that you choose at the regularly scheduled time. 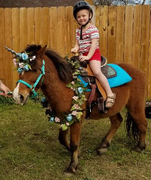 M&M Pony Express will deliver the ponies 30 minutes before your party or event time and stay with you for the duration of your party hand leading lead in ponies or helping children on and off of the pony carousel if you choose to rent a carousel of ponies. 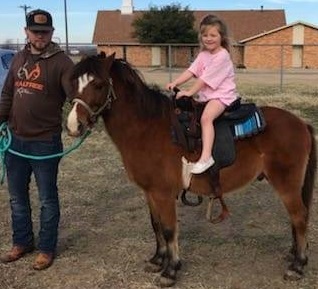 Lead in pony rides work great for smaller pony ride parties and start at only $175.00 per hour for the first hour and $100.00 per hour for the every hour after that. 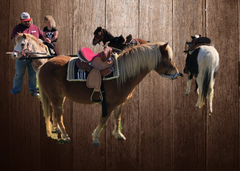 Lead in Pony rides are done by M&M Pony Express trained staff and will be hand-led for the duration of your party. All Ponies are fully saddled and have a matching halter and lead rope. All tack is in new condition and maintained excellently so they always look great and ready for your children. We can also offer your child a unicorn pony ride with a pony decorated in floral arrangements and a horn. You can even choose to have a carousel full of unicorns. Unicorns are $25.00 more per pony per hour. A half down deposit is required to book pony parties. The parties are non-refundable; however, you can change your date or if the weather is bad on your rental date, we will simply credit your deposit to a future party date. Let our ponies help you with your next party or event. What child does not love a pony?